One person’s discard is another one’s treasure. That’s the philosophy behind clothes swaps—friendly social gatherings where participants, usually women, bring clothes and accessories they don’t need or want anymore, and walk away with new discoveries to invigorate their wardrobe. Anything left over after the frenzy of the hunt is donated to a charity, such as Goodwill. At many clothes swaps, no money changes hands at all. Some are fundraising events with a cover charge (typically $20, or an unspecified donation), and the proceeds go to a selected cause or charity, such as a local women’s shelter or tsunami relief. Even with a nominal entrance fee, participants still spend only a fraction of what their bounty would have cost new. Swaps organized among 10-30 friends and acquaintances tend to be held in someone’s home. Well-advertised, larger-scale swaps organized by nonprofit organizations or swap enterprises draw hundreds and may be held in a rented space, nightclub, or school gym. Some are genre-specific, such as a swap of just kids’ clothes. Rules for participants vary. For some, it’s bring one bag, take one bag: arrive with a shopping bag full of your discards and leave with a bag stuffed with your finds. For others, the only rule is bring what you don’t need anymore and take what you like. Swaps with that guiding philosophy trust that it will all even out in the end. "Rules for participants vary. For some, it’s bring one bag, take one bag: arrive with a shopping bag full of your discards and leave with a bag stuffed with your finds." “If you take home something that doesn’t work out, just bring it to the next swap,” advises Alix Madrigal, who has been part of a seasonal clothes swap for more than 20 years in Marin County, California. Logistics can be formal or informal. Some employ a system whereby clothes are dropped off in advance or upon entry, and a group of volunteers sorts the loot into separate areas for tops, pants, dresses, coats, sweaters, shoes, and accessories. While the sorters are sorting, the swappers are socializing or waiting with rabid anticipation behind a starting line. For these kinds of swaps, that drop-off and pre-swap period might be an hour. At the home swaps I attend, the host designates the areas of the living room and dining room for types of clothing—with a couple of portable racks for hanging dresses and coats—and the swappers empty their own bags as they enter. The first arrivees spend about a half hour on this before the swapping begins. As new people arrive with their bags over a period of an hour or two, each new infusion is welcome and the hungry swappers pounce on the new items like bees on clover. Invite people to clean out their closets and bring gently used (no stains or rips), preferably stylish clothes and accessories they no longer need. Either establish a one-bag of discards to one-bag of discoveries policy or let people bring what they have and take what they like, with no maximum or minimum. Have a cover charge (maximum $20) to raise money for charity or a cause, or to cover expenses for location rental. Plan on the event being about two hours. Some large events may need an hour of sorting by volunteers before starting the swap, and may be swept clean by the hordes in 20 minutes. At casual home events, swappers can unload and sort their own stuff upon entrance, or the host may prefer to have volunteers do it. Give swappers access to mirrors, preferably one or two full-length. Otherwise there could be a big backup for one tiny bathroom mirror. 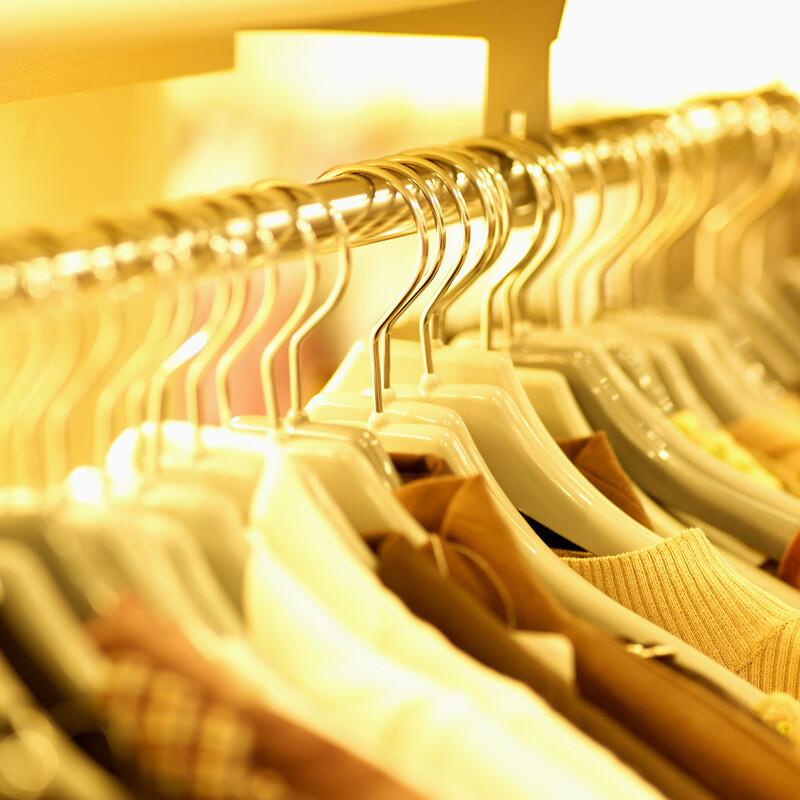 Take any unclaimed items to Goodwill or another nonprofit that accepts clothing donations. Swap for Good — A San Francisco, California, volunteer organization with a mission is to stop domestic violence, encourages hosts to collect $20 at the door to donate to a local women’s shelter. Swap.com — An online swapping community based in Boston, Massachusetts, that has an “Events” tab on its website so you can find clothing swaps in your area. The S.W.A.P. Team — This environmentally conscious Montreal, Quebec, nonprofit with chapters in the United States and Switzerland seeks to keep garments out of landfills. Clothing Swap ® — This San Francisco, California, outfit combines cocktails and spa treatments with swapping in three-hour Diva Eve events with an entry fee to cover expenses and raise money for charity. Watch New Dream's video on How to Host a Clothing Swap! This article was written by Regan McMahon and originally appeared on Shareable.net on July 18, 2011.